INDIANAPOLIS (October 3, 2014) — Klipsch, a leading global speaker and headphone manufacturer, announces today that a photograph of brand ambassador Josef Newgarden and his company-sponsored IndyCar has been named the recent gold-medal winner of the National Museum of Sport’s International Fine Art Competition in its photography division. Central Indiana native and photographer Chris Bucher captured the photograph for Klipsch during qualifications for the city’s inaugural Grand Prix that took place at the Indianapolis Motor Speedway in May 2014. 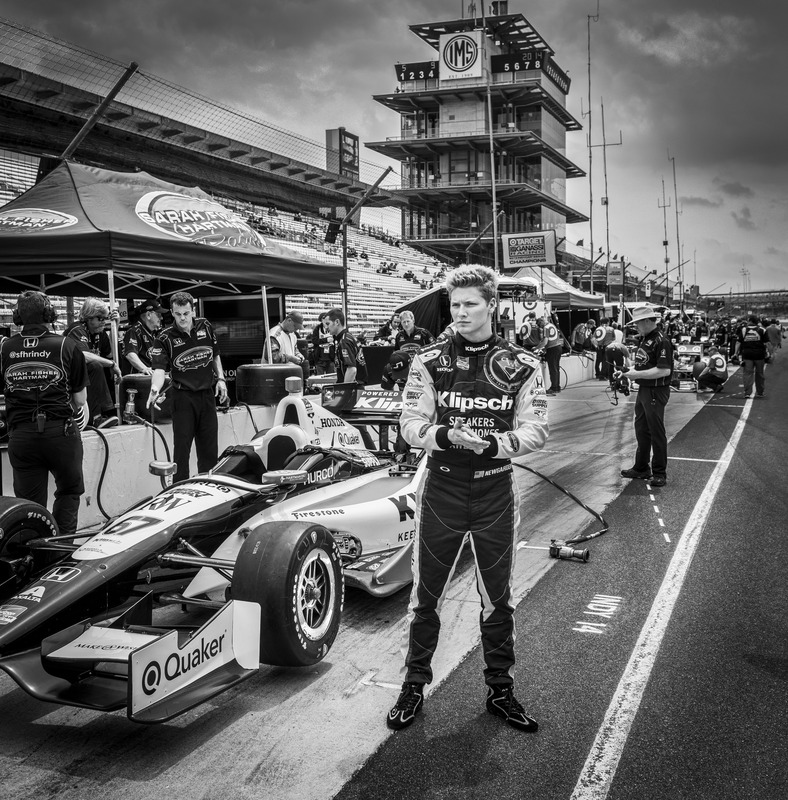 As a Klipsch brand ambassador, CFH Racing’s Josef Newgarden plays a major role in creating new opportunities for both brand and product visibility in the world of racing. His youth, passion and high-achievement standards also translate perfectly across the company’s brand ideals. Klipsch launched a large-scale sports marketing initiative in 2013 that has since incorporated world-renowned athletes into the daily activities fueling the brand and its overall growth. Brand ambassadors include Andrew Luck (Indianapolis Colts), Robert Mathis (Indianapolis Colts), DeMar DeRozan (Toronto Raptors), Roy Hibbert (Indiana Pacers) and Josef Newgarden (IndyCar). The internationally acclaimed and award-winning photograph will be unveiled as a permanent installation at Klipsch corporate headquarters on October 8 at 11 a.m. On hand for the unveiling will be Josef Newgarden, along with team co-owner Sarah Fisher, as well as photographer Chris Bucher and Elizabeth Varner from the National Museum of Sport. For over 65 years, Klipsch has designed premium speakers for those who are passionate about great sound. Company founder Paul W. Klipsch started this legacy in 1946, and it continues today with sheer commitment to innovation and delivering the world’s most powerful, detailed and emotional sound reproduction. Today, the brand’s diverse product portfolio encompasses home theater, professional cinema, installed whole-house contracting, commercial, computer speakers, wireless portable speakers and headphones. As one of the first U.S. loudspeaker companies, Klipsch continues to be the high-performance brand of choice for audiophiles and home theater aficionados around the world. Klipsch Group, Inc. is also a wholly-owned subsidiary of VOXX International Corporation (NASDAQ: VOXX). An Indiana native, Chris Bucher is a commercial photographer, artist and author whose work is extremely diverse. His commercial photographs are seen in magazines, advertisements and websites throughout the country, and featured in the Communication Arts Photo Annual in 2009. His works hang in galleries throughout the world including the London Photographic Association and the Center for Fine Art Photography. Bucher is the author of two educational books about photography, “Lighting Photo Workshop” and “Black and White Photo Workshop.” For more information, visit his website, www.chrisbucher.com. CFH Racing, co-owned by Ed Carpenter, Sarah Fisher and Wink Hartman, will field two cars in the 2015 Verizon IndyCar Series with Chevrolet engines, the same engines that have guided Chevrolet to three consecutive Verizon IndyCar Series manufacturer championships. CFH Racing announced its formation on Aug. 16 with the merger of Ed Carpenter Racing and Sarah Fisher Hartman Racing. The team will be based at 1255 Main St. in Speedway, Ind., a few blocks from the legendary Indianapolis Motor Speedway.